She's finished. FB URC has finally realised she's a fraud so if she's got any sense she'll shut up and go and get help for her issues. I was hoping for more insight in Amyâ€™s ultrarunning history, which I wasnâ€™t able to find. It seems like there is none of that. In my opinion, Amy Hughes is a fraud. There is no way that she could have run 521 miles on a treadmill. Even if you would consider an error margin of 10%, that would be 468.9 miles in 7 days or 67 miles per day. That would be 401.9 miles (646.68k) in 6 days. If you look at any of these ladies results, they all have a long list of running accomplishments. Amy Hughes has none of that. It would be great if Amy could prove her running excellence in a real 6 day race but probably it will never happen, like the 6 day race Robert Young promised us to do this spring. The typical behaviour has now begun - she's crying out about hurtful comments when there have been very few, and ignoring the legitimate analysis of her capabilities. I like your new alter ego Derek. The idea that a boyfriend can't count miles just because he's a "man" doesn't hold water for me either. Wow, can't believe how many people are willfully ignorant and believing everything she says. Makes me question humanity. I will be keeping a close eye on this Amy Hughes. Seems like I should write a counterpoint of her to point how all the lies and send it to the newspapers. So basically a relative unknown, with no experience other than running a few marathons (ie, no multi-day or trans-con efforts), is claiming she ran 3 marathons a day for 7 straight days. Right. I noticed Laz commented on that FB post. Hopefully they'll get on the case and report their findings here. And if we're really lucky, maybe a resurrection of fake Laz. I followed this quite closely at the time, as she is a good looking girl and I'm a simple man. 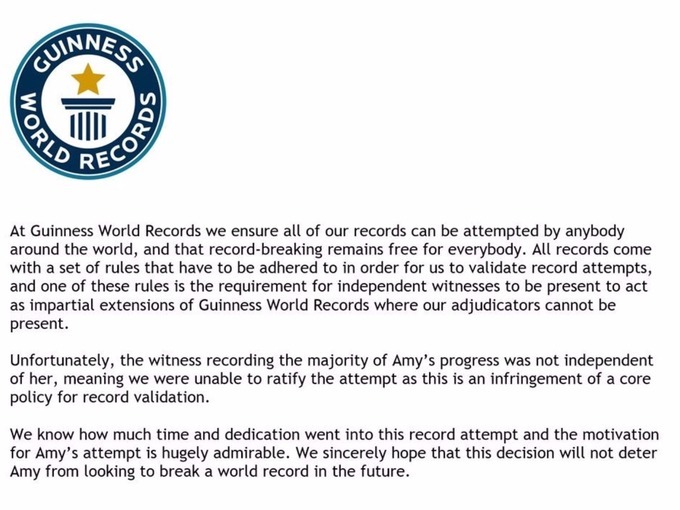 Didn't really raise any alarm bells for me until all the recent media attention and #justiceforamy crap on twitter, which just came across as petty and stupid, when the rules from GWR were quite clear. Now suddenly, people are starting to analyse the numbers and make comparisons to other, more established ultrarunners who have done similar treadmill stunts and it definitely looks doubtful she did the mileage she claims. I'm amazed that the sponsors behind this stunt didn't do more due diligence into Amy's pedigree and the recording of the attempt. This is another example of corporations being so greedy for exposure that they really believe this vacuous girl ran 26 miles a day for 53 days and was capable of setting an incredibly difficult world best while day dreaming about unicorns in a shopping mall. Does anyone know what sort of funding was provided for this event? Does she make a living from stunt running? Where was Michael Speicher while all this was taking place? Would anyone here like to buy some compression socks? Ha ha this is funny. Besides the picture from that professional photo shoot she doesn't seem to have much muscle tone or definition. How do you run 53 marathons in 53 days and not firm up a little? Laz has arrived about a week earlier than expected. That's apparently because he'd run out of cigarettes so was able to fight hard to hold his pace. Luckily Amy was knocking out a few 6 minute miles on the treadmill when he arrived so we're still hoping to get his backing for the GWR social media campaign. No-one does social media better than Laz. Dave Keighley, (Amy's boyfriend and unrecognized Guinessbook witness) responded but he removed it straightaway after I commented. You are a body shaming troll. Why not spend more time running instead of looking at the seductive photos that my GF keeps releasing to the media? Yes, this type of stunt running is her real full time job. She was a former personal trainer according to her 53 Foundation bio. Amy Hughes and her boyfriend David's only real jobs is being the owner of their "53 Foundation" "charity" for which they do these stunts and solicit money. An online donation link is prominently displayed on Amy Hughes website to her personal 53 Foundation for this event. Probably other sponsors I don't know about. On her boyfriend's Facebook page, he lists himself as "Self-employed" meaning he is otherwise jobless other than for being one of the owners of the 53 Foundation. So all the money from the publicity of this stunt would either go directly to them out to their 53 Foundation and then to them to spend with who knows what transparency.